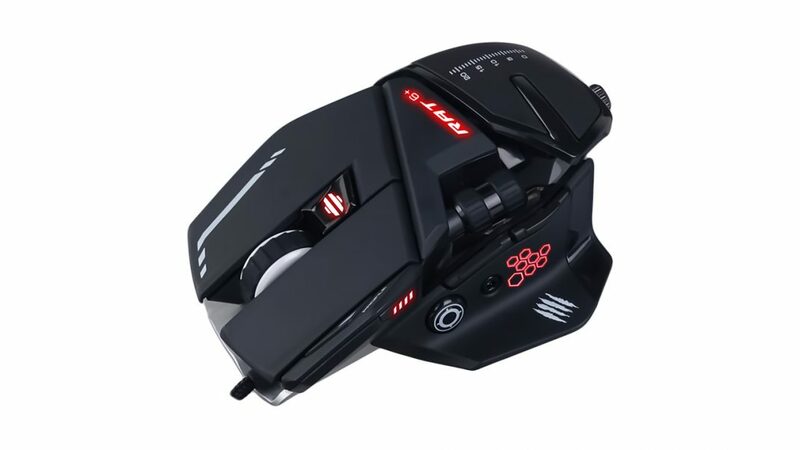 Mad Catz Global Limited, the new name for the leading innovators in gaming hardware for almost three decades, announced today an all-new range of R.A.T.™ gaming mice, serving as the first line of products to be released under the new company management and expected to begin shipping globally from Fall 2018. In addition to the new mice, Mad Catz Global are also expected to being shipping the E.S.Pro+ Gaming Earbuds, a new take on ultra-lightweight gaming audio in the same time frame. The highly acclaimed, award-winning R.A.T. mice are renowned for their high levels of comfort and adjustability and the all-new R.A.T. line has been designed to build upon the proud lineage of hardware, adding cutting edge sensor technology, advanced features and RGB lighting to several of the mice. R.A.T.2+™ Bringing adjustable RGB ambient lighting to the R.A.T. range for the first time, the R.A.T.2+ features an adjustable palm rest, four programmable buttons and the popular Pixart PMW 3325 optical sensor, capable of withstanding high movement speeds of up to 100 inches per second and 20G of acceleration. R.A.T.4+™ Featuring industry leading OMRON switches (rated to a lifecycle of 20 million clicks), the R.A.T.4+ has been designed to deliver flawless precision at all times. Powerful LED’s provide multi-zone backlighting while the Pixart PMW 3330 optical sensor delivers trusted performance. R.A.T.6+™ Ramping up the customization options, the R.A.T.6+ not only features nine programmable buttons and an adjustable palm rest but adds a removable weight system to the mouse allowing gamers to find their ideal weight for their weapon. Chameleon RGB Intelligent lighting, illuminates the mouse across three separate lighting zones, bathing the R.A.T. with over 16 million lighting combinations, while luxury OMRON switches have been tested to up to 50 million clicks for superior performance. 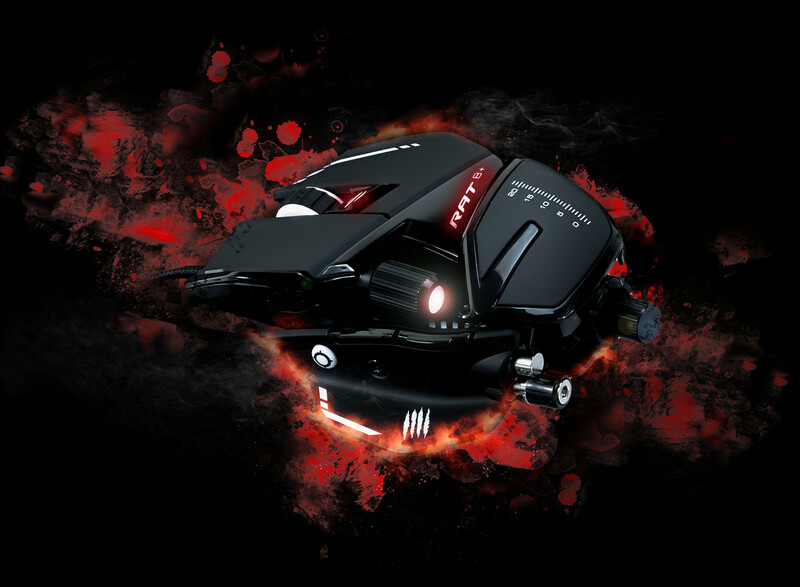 R.A.T.8+™ Designed for the professional gamer, the state-of-the-art Pixart PMW 3389 optical sensor delivers unrivalled precision across any gaming genre. Fully customisable, the R.A.T.8+™ features an adjustable palm rest and thumb rest, as well as removable pinkie grip and if you don’t like the feel of your components, the mouse even ships with replacements for the perfect fit. 18G of removable weights allow the gamer to perfect the feel of their R.A.T. while the three stage Chameleon RGB lighting keeps the R.A.T. looking as good as it performs. On board memory allows gamers to save up to three profiles, containing macro button, sensor and lighting settings when travelling to tournaments. R.A.T. Pro S3™ Lightweight, ergonomic and unmistakably R.A.T., the PRO S3 concentrates on delivering the essentials that many professional gamers demand. Powerful Pixart PMW 3330 sensor delivers proven gaming performance, while ultra-reliable OMRON switches have been tested to an impressive 50 million clicks. The palm rest is fully adjustable, tilting plus or minus 15 degrees side-to-side, and extending up to 12mm from the mainframe. Chameleon RGB lighting once again features. R.A.T. Pro X3™Precision incarnate, the Pro X3 is the worlds’ most adjustable mouse. Built upon a magnesium alloy chassis that’s light and super strong, the R.A.T. Pro X3 utilizes a super-hydrophobic coating to keep hands dry in the heat of battle. The revolutionary scroll wheel system, uses optical technology and analogue axis capability, to precisely calibrate tension and speed. The scroll wheel system features the world’s first analog strafe, utilizing the optical encoder which allows the wheel to pivot from side-to-side giving players unheard of movement and precision using the scroll wheel alone. Every aspect of the Pro X3 is customizable. Adjust palm rest, thumb rest and pinkie grip or replace the feet of the mouse to adjust the surface tension! Components of the mouse can be replaced entirely via a whole suite of extras which ship in box. Remarkably, with a simple click, gamers can replace the actual sensor unit of the mouse, and swap for a variety of sensor modules (sold separately) in an instant. No longer do gamers need to replace their mouse when new sensor technology becomes available, the Pro X3 provides a future proof platform designed to last a lifetime. Packing all the quality and performance of a full-size gaming headset into a small form factor, the E.S.Pro+ Gaming Earbuds are incredibly lightweight and portable, making them idea for tournament play and sustained gaming sessions. True plug-and-play design allows the Earbuds to be plugged in to any PC and feature enlarged 13.5mm speaker drivers with dual microphones to give crystal-clear clarity to online chat. The E.S.PRO+ Gaming Earbuds ship with an assortment of different earbud sizes, allowing the gamer to customize their earbud to the shape of their own ears.